There was this blog called ‘Life is an STD’ that consisted alternately of images of callipygous male bum, and out-of-control diatribe on the subject of the United States. I used to visit this blog from time to time, not for the bum which all things considered was a little garden-variety, but to be witness to the black hole that was developing. The blog did eventually implode, and I do wonder if the author wasn’t hauled off to the ‘nervous hospital’. So that Domani Dave will not develop such a reputation, I have decided to depart the subject of D*n*ld Tr*mp for good. I haven’t name-dropped in a while, but since my drop-worthy names have become so dated (though I do know Tom Ford’s husband, Richard), I don’t know if they even count anymore. 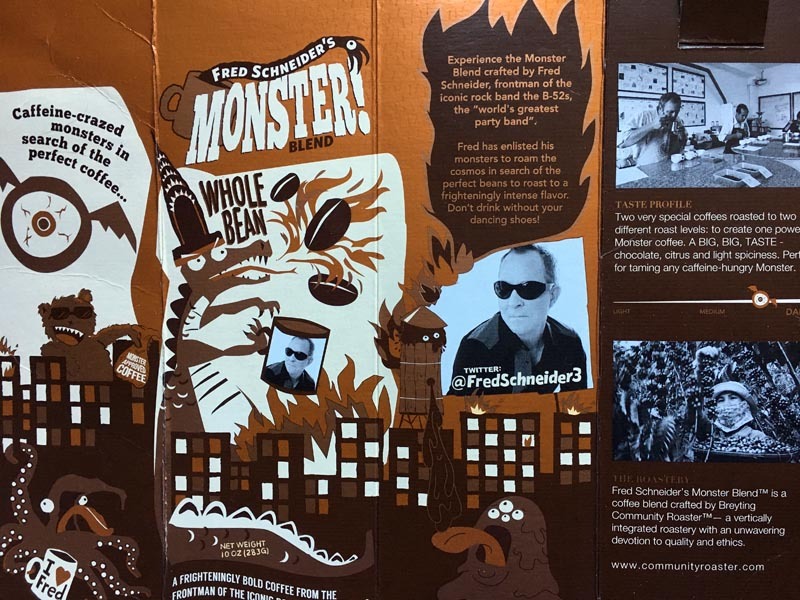 This morning, we are drinking Fred ‘The B-52s’ Schneider’s ‘Monster Blend’ coffee. As I quoted last post, ‘A boy has to make his way in the world’, so Fred (who is a friend of ours) licensed his name to this enterprise, which rather like Paul Newman’s line of products, supports worthy causes, in this case, removal of UXO (‘unexploded ordnance’, bombs) in Southeast Asia. Earlier this month I got new glasses, and when picking new frames, I espied a pair which I could not understand why I recognized. So strong was my attraction to them over any of the others I was fondling, they essentially picked me, rather than the other way around. 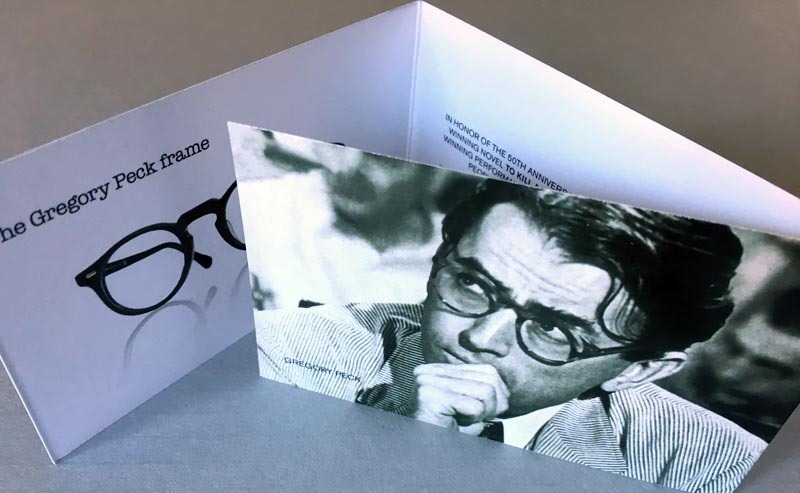 Lo and behold, the eyewear company Oliver Peoples had licensed the Gregory Peck name from his estate to market a tweaked version of the glasses he wore in To Kill a Mockingbird. The ones I chose are not tortoiseshell, but translucent grey, however I still look rather ‘adversarial’ in them. With all this in mind, I’ve decided to license my own name for a product, but I have no idea what or which. I haven’t given it a great deal of thought at this point, but I could use your help. I don’t think there’s so much as one good reason for any rude suggestions. Rude suggestions? What do you mean, who would do that I wonder. Surely no one you know. Don’t be surprised if you are mistaken for a lawyer or Gregory Peck on the street, you can always claim to be his younger twin. Hello I’m Dave Peck and you are? Since you have a fondness for Greece maybe you could lend your name to a Greek product, like olive oil or soap or a line of Greek Classic books. What about a line of κομπολόι? No actually it has κομπολόι written all over it but hey it’s your marketing plan. Actually I had a love set of κομπολόι which Laurent bought me in Athens. I carried them around for two weeks and then put them down on the table while we having lunch in the Plaka – I turned around and they were gone. I always suspected the people at the table next to us! So if you do decide to start the marketing count me in for a set. I remember and miss that blog. I think your name would fit well with many products. I always thought you should write a kids book about that family you invented. I’ve tried to find the post in your archive but can’t locate it.